Mr. Marley has generously offered to allow CharityBuzz to auction off three (3) VIP events for two (2) on his REBELLION RISES TOUR. The winner(s) will enjoy this highly anticipated tour that only a select few get to experience up close and personal, meeting Mr. Marley. After the concert at a tour city of the winners choosing, a photo opportunity will be provided during their meet & greet with Ziggy Marley himself. The tour starts in America and travels to several European cities. Raising funds for the oral cancer issue via OCF, this auction will help support awareness campaigns, research, early discovery initiatives, and outreach that will help save lives. Available tour dates are here (Dates may be subject to change). 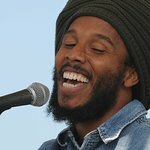 Reggae icon Ziggy Marley will release his seventh full-length solo studio album, Rebellion Rises, on May 18th through Tuff Gong Worldwide. Fully written, recorded and produced by Marley, this passionate and indelible new collection of music encourages people to stand together in activism through love. Ziggy Marley has released many albums to much critical acclaim. His early immersion in music came at age ten when he sat in on recording sessions with his father, Bob Marley. As front man to Ziggy Marley & The Melody Makers, the group has released ten live and studio albums, three of which became GRAMMY-winners with such chart-topping hits as “Look Who’s Dancing,” “Tomorrow People,” and “Tumbling Down.” Then, in an effort to pursue his own creative endeavors, 2003 saw the launch of Ziggy’s solo career with the release of Dragonfly (RCA Records). His second solo effort, Love Is My Religion (Tuff Gong Worldwide), won a GRAMMY in 2006 for Best Reggae Album, as did the subsequent release of Family Time (Tuff Gong Worldwide) in 2009 for Best Children’s Album. 2011’s Wild and Free was also nominated for Best Reggae Album, the same year in which Ziggy debuted his first-ever graphic novel, Marijuanaman. In addition to his music, Marley established the U.R.G.E. (Unlimited Resources Giving Enlightenment) organization to help children in poverty. You can go directly to the auction item and start bidding here.